“Paal poori” translates to deep fried Indian bread bathed in saffron scented milk in English. 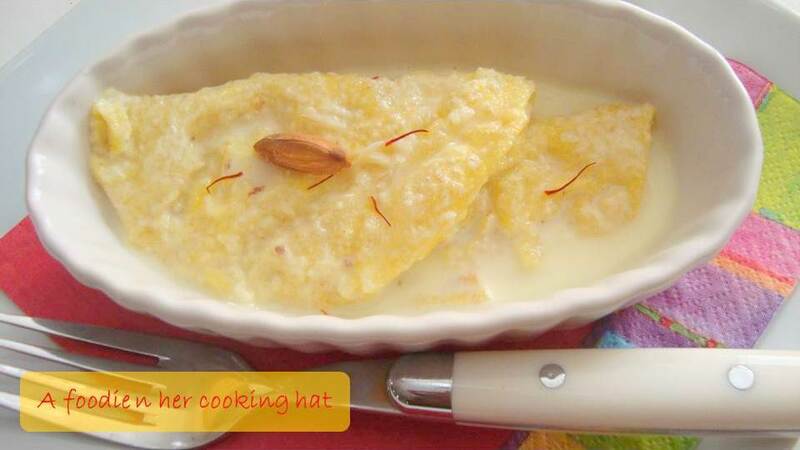 I love this dessert and this dish brings back a lot of sweet memories of my childhood. Every year I would receive either an endowment prize or Best Student or Top Scorer award during our school annual day program. My teacher would announce it couple of days before the actual function. I would rush back home to share the news with my mom, who would treat me with these sweet puris by the time I return from my evening play time. This dish always reminds me of success and its delicate sweetness conveys the taste of victory to me. When our boys in blue won the cricket world cup, I couldn’t think of any other dessert other than this. I was in the mood for some lip smacking Indian dessert. I pulled out atta, cardamons, sugar, almonds and milk. The milk was boiled to creaminess with a dash of exotic cardamons which my mom got for me from Srilanka and simple Costco sugar. The deep fried puris puffed up beautifully to be drenched in the deluge my Iranian saffron-scented milk. Once chilled, they were a part of our victory dinner. It tasted heavenly. Slurp!!! Love you Indian cricket team! God bless you all. Long live our BOYS! This post is for you guys. 2. Sprinkle 1/4 cup water over the whole wheat flour and salt. Mix them well with hand or in a processor. Keep adding little more water to bring them together. Knead the dough well. Rub both hands with little olive oil and knead the dough for couple of minutes. Cover and store them on the kitchen counter. 3. In a cooking pan, bring the milk to a boil. Add crushed cardamon / cardamon powder and simmer it for another 15-20 minutes. Sprinkle the sugar and almonds and switch off the stove. Pour the saffron strands (along with the soaked milk) over the hot milk and cover it. Let it cool, once they have come down to room temperature. Transfer them to refrigerator and let it chill. 4. Dust the kitchen counter with flour and simulataneously make small sized balls out of the dough and roll it into fairly thin circles (with a rolling pin), about 2 cm radius. 5. Heat oil to 375’F and deep fry the puris. Once they lightly brown, turn and cook for a minute. Remove and drain excess oil on a kitchen towel. 6. Transfer half the milk to a fresh container and store it. We can pour them before serving. To the remaining milk, soak the hot puris. Chill them for atleast 30 minutes. 7. At this time point, the puris would have absorbed all the milk. Carefully remove one puri. Transfer it to a fresh serving bowl, pour the reserved milk and garnish with crushed almonds. 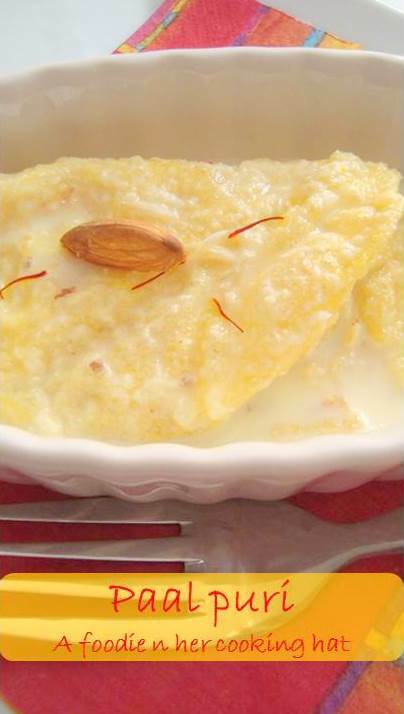 so a dish for India.. sounds interesting..
New to me…looks extremely yum…..
Awee…how sweet memories you have with this dish….i have never had something like this . It's unknown in the north of India . looks soo yumm and inviting……… lovely post dear! That looks really yummy…Paal poori is sumthing new to me:-)Will try it soon!! Yumm, my fav paal puris, beautiful shots..
Paal puri looks tempting Vijitha! very nice recipe! Yummy yummy!!! looks so inviting! Pal puri looks awesome delicious. I think I have tasted this or am I imagining (Deja Vu).Anyhow, this looks really good! I have never tasted this. Looks very yummy !!! I have few awards for you :-). Please come and collect it from my blog. Perfect dessert to celebrate the victory ,looks ravishing .